US president Donald Trump’s budget, named “A new foundation for American greatness,” would trim over $1 trillion from programs to help the poor and lower middle class over the next decade, with cuts targeting food stamps, subsidies on student loans, and tax credits for some people with children. A more detailed version of the Trump budget that was first introduced in March was published by the White House today (May 22), but embargoed until 9pm. This proposed budget slashes government departments like the Environmental Protection Agency and the State Department, as was expected. But it also attacks programs and institutions that directly impact low and mid-income Americans more severely than anticipated. Collectively, these cuts represent a big departure from the pro-working class image Trump cultivated on the presidential campaign trail, when he promised student loans could be forgivene after 15 years and that he would “save” Social Security and Medicare. 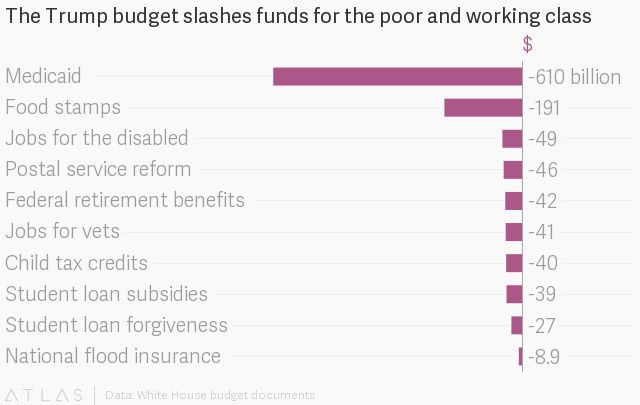 The budget also cuts Social Security disability spending, refuting another campaign promise. “This is a taxpayer-first budget,” Mulvaney said. “For the first time in a long time the administration has written a budget through the eyes of the people who are paying the taxes,” he said, rather than those who are receiving benefits. Although there’s almost no chance that this budget will pass Congress in its current form, a Republican-led Congress will likely work hard to include at least some of Trump’s suggested cuts to benefits for the working class.